Below is a review of the Cumann na mBunscol Strategic Plan. The full review is available for download here. Summer Courses to be available in 12 counties in 2009. Recruit from graduate teachers as ambassadors to training colleges for Cumann na mBunscoil. Provide equipment grant aided and sponsored to all primary schools. A database of contacts has been drawn up at national level. Seek a dedicated notice-board in each school. Update circular to all schools on function of Cumann na mBunscoil. Produce DVD and Powerpoint. Carry out facilities audit of in house and external . Produce data base and circulate to all schools. Work with county boards to ensure schoolâs needs are reflected in coaching strategies. Develop annual coaching template that is Timed, Educational, Resourced and Relevant . Dedicated notice board in all schools. N.B Allianz. All new pitches to accommodate cross field under age pitches. Lobby Govt to recognise significance of role played by C na mB volunteers in enthusing young people. Monitor content and quality of coaching delivered to schools from the outside to ensure its appropriateness to schools. N.B go Games and Charter. Full use made of County Committee representation on County Boards.Officer turnover,improved links, official slot on agenda. Each school to identify its Parent Club. Club /School liaison Officer. Direct support from club/ financial, coaching,facilities. Club and School to share its branding ie its markeability. School delegate to attend club AGM. Forge links with local Secondary Schools. Cumann na mBunscoil involvement in Provincial Coaching and Games initiatives/conferences and promotions. Sponsorship strategy currently under review. 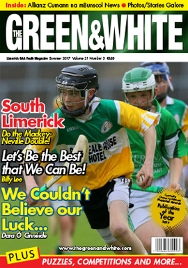 Seek a dedicated Cumann na mBunscol page in all Provincial and National Finals. Cumann na mBunscoil name must be included. Website redesigned/ county ,provincial and national links. PR Plan/ Greatest challenge. Template for each county. Each county to provide a PR Plan. Sponsorship review at National and Local level. Maximum return for investment in Cumann na mBunscoil brand. School Mark Scheme/ Excellence Rewarded. The journey From Cumann na mBunscoil to Croke park. Highlight the historical trip of those who played in Croke Park in Mini games and returned as Adult Players. Visits from county players. Children to meet and greet county players in county grounds. 2021 will be 50th anniversary. Historical Publication. Good Practice for officers to be outlined at comhairle seminar. 5 year rule generally accepted/ Good use of new blood and use to be made of retired teachers. Template for Governance / minimum requirement of meetings. Model of good practice for each committee. Short A4 sheet of 5 year plan to be submitted by each county coiste. Each County Coiste to hold meeting with County Board Officers at beginning of each year.